� Glasto 2019 ticket day today! This is a reminder that, to secure your Glastonbury 2019 ticket, you must pay the balance of your ticket cost during the ticket balance payment window - from 9am Monday 1st April until 23:59 (BST) Sunday 7th April 2019. You can make this payment online at http://glastonbury.seetickets.com. Please follow the link (between 1-7 April) to pay your ticket balance. The balance due is �198 (plus a �5 booking fee) per person; plus a �8.95 transaction fee (postage and packing or box office collection for international bookings) per order. Whilst paying your balance you will be given the option of booking ticket refund protection and car park tickets. Please visit www.glastonburyfestivals.co.uk for more details. The first official poster is out and there's some crackers on there, some alright and some utter pish. As is always the case at Glastonbury you can avoid/miss any of these quite easily. Expect a more detailed lineup with stages, times, etc fairly soon. Returned coach packages for Glastonbury Festival will be on sale from the evening of Thursday April 25 followed by a general admission resale on the morning of Sunday April 28. Ticket balances need to be paid by 7 April. Good news. In future years the festival has been given permission to expand by 7000 people as long as those people travel by public transport, so that's 7000 more coach + ticket packages on sale next year. My only concern is infrastructure and that some areas of the site are already creaking through overcrowding and that this could push those areas over the edge. Still, we haven't had full details and this means more folk can attend the 50th anniversary next year. As the New Year looms, the lineup starts to form with Kylie Minogue playing the Sunday afternoon slot. Expect more names to come soon, but til then have a Happy New Year and don't forget the ticket resale in April! Glasto 2019 ticket day today! 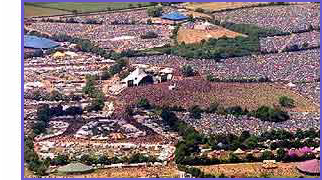 Copyright � 2001-2004 Glastonbury Forum. All rights reserved.